You guys asked for it, so here ya go! Some recent outfit pics. Skirt: Target (no longer available) but this skirt via Nordstrom is basically the exact same thing! 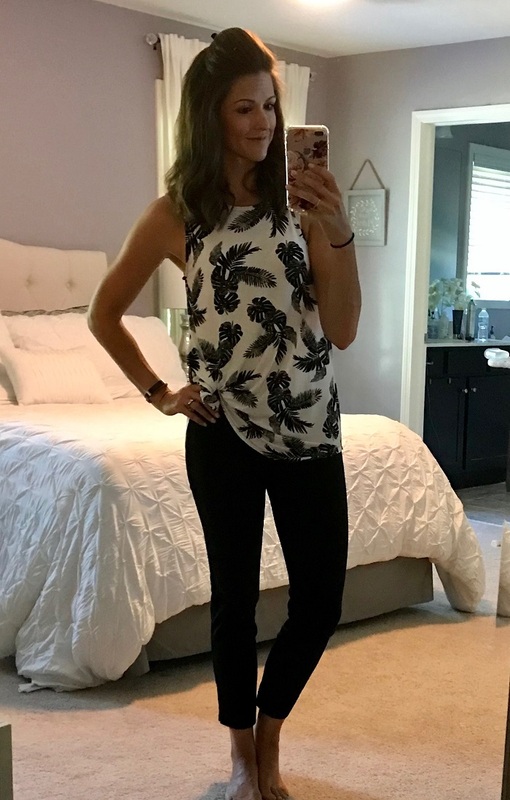 You guys may remember my love affair with these swing tanks from Old Navy, and this is just another one that I’ve added to my (growing) collection). 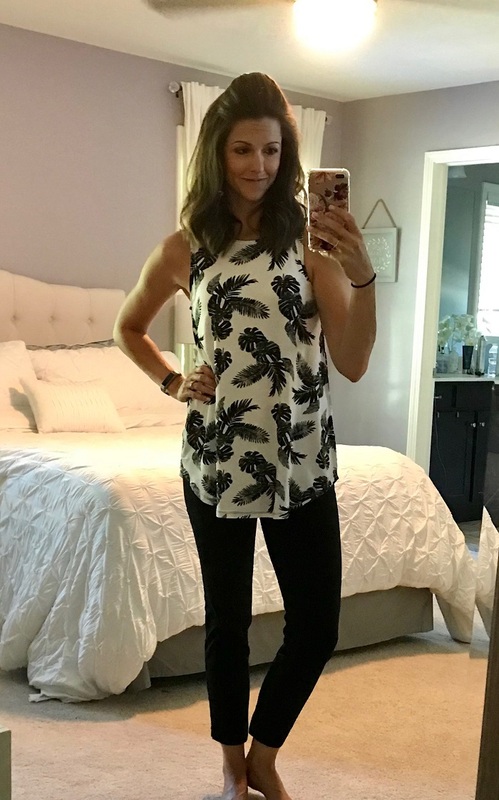 White Jeans: Just Black via Stitch Fix. THESE are very similar! I’d actually love to find a really cute bralette to wear with a shirt like the red one above, since it can show a little shoulder. American Eagle has some cute ones (like this one!) so I may have to check them out sometime soon. Not much more to say about this outfit except the fact that I totally swapped out the wedges for my comfy sandals after taking this picture because I realized life is too short for uncomfy shoes, even if they are way cuter. Out of all of these outfits from this post, I’d say this might be my favorite and the most “me,” if that makes sense? 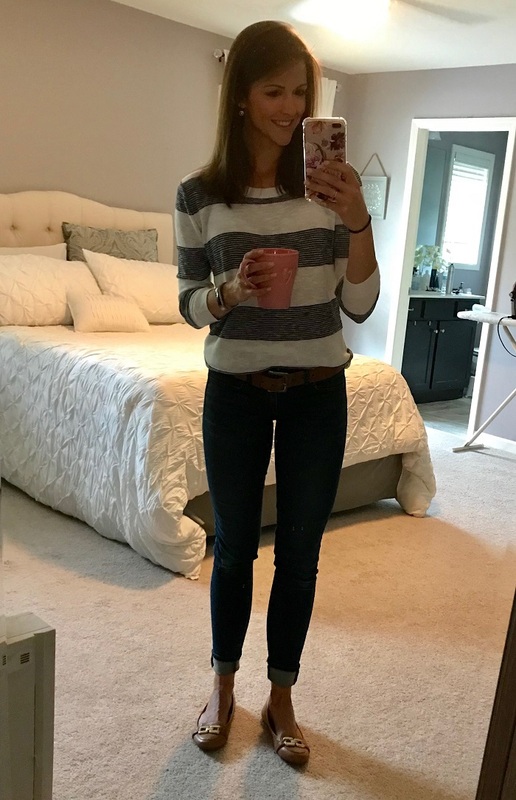 This is just the type of outfit I feel most comfortable in, and I’m always drawn to navy/white and nautical looks (hence, the shirt in outfit #4, too). That about does it for outfits, but I DID want to include this picture below, just because I actually had a number of people reach out asking for details about my tank top! I mean, it’s just so versatile! (Tank shown above in black, paired with these mid-rise twill shorts in railroad stripe). I love your style. Keep these type of style posts coming every so often. P.s. Girl, have you lost weight? I definitely don't mean this negatively (I feel like i need to stress that with all the internet negativity) --- just an observation! You look fab! Ha before even reading your description on #6 I thought that was my favorite for sure and it’s such a flattering look on you too. I want that sweater so booo that it is from 2-3 years ago!! Love all your styles!!! Super cute and comfy. Not boring at all!!! I've seen you mention the American Eagle pants a few times, but I haven't shopped there in a while! Do you feel they run true to size or do you size up? Thanks! I love these posts because they're relatable. I can't stand posts with people's outfits that are so far out of my budget. 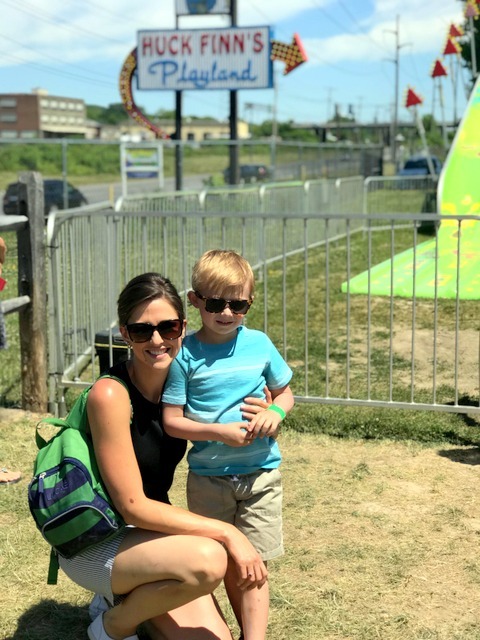 I can't afford a $75 top that my kids will stain! Or my husband will inevitably leave a chapstick in his pocket during the wash... Ugh, ha. SAME! I can't justify $$ clothes when my job doesn't call for them, frankly. 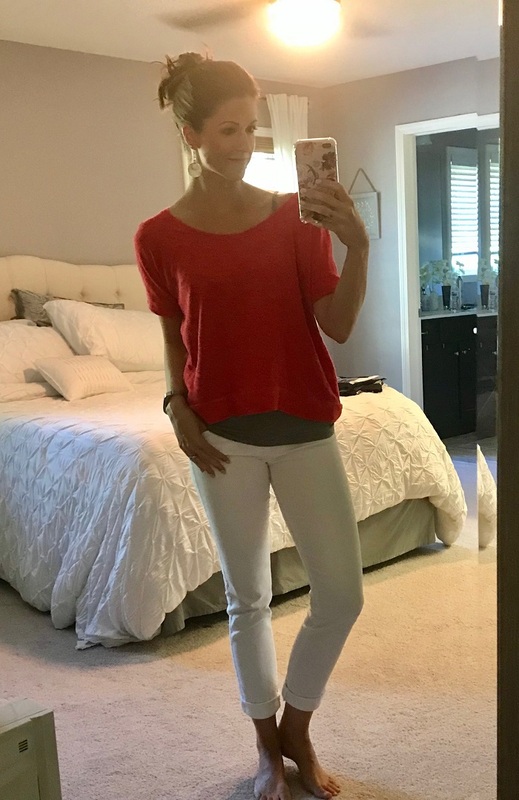 Love that you wear affordable and mom-friendly clothes! Outfits are super cute and you look great! Oh man I'm loving those jeggings on you and the swing tank, I wish they had it in that pattern still. I got these pants in solid black and pattern ( in Canada) from ON and I feel like you'd die in them, they legit feel like Pj's so can't beat it!! https://oldnavy.gapcanada.ca/browse/product.do?cid=93431&pcid=5475&vid=1&pid=320198003 I love your style because it's soo much like mine, practical but soo freaking cute! You're killing it! 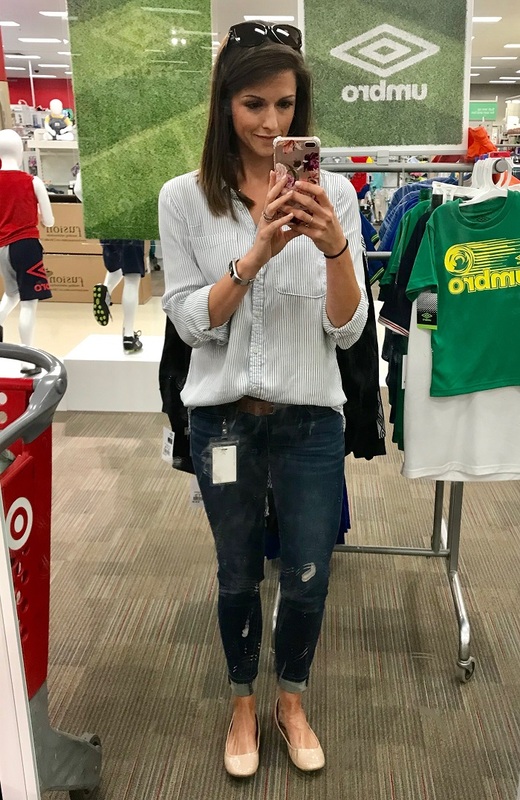 Haha...I wore your exact outfit #2 just yesterday (paired with black sandals) and I own the same flats from #4 that I wear all the time...keep it coming, we definitely have similar styles and I love to see new ideas! No way?! Haha great minds!! I really like that tie top from Old Navy! I love your outfits! 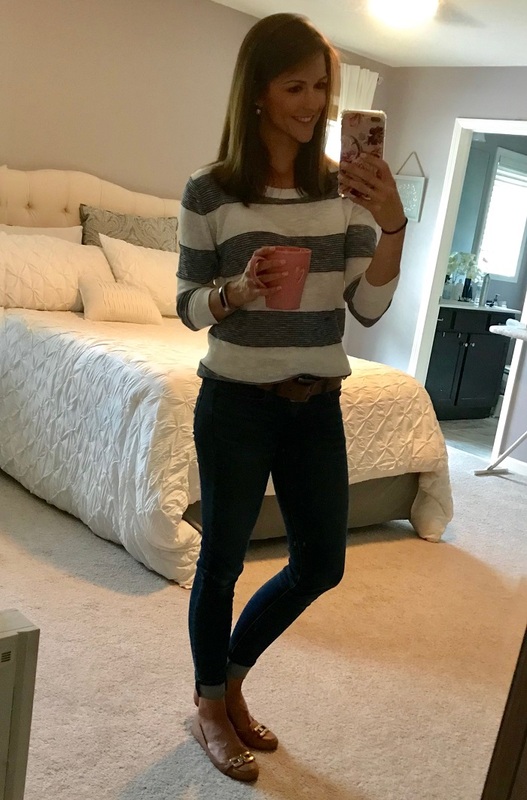 Very similar to what I wear; my office is also pretty casual and I tend to wear dark blue or black jeans a lot. 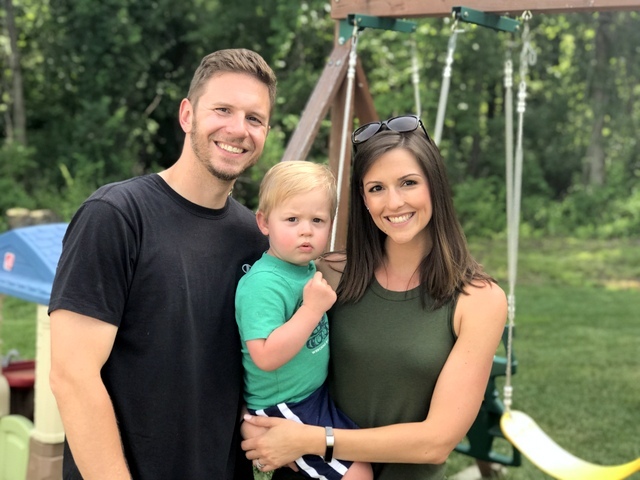 I am pregnant right now (with our second and last baby!) and cannot WAIT to start working on my "real" wardrobe again. I haven't invested in good clothes in a couple of years because of pregnancy! So cute and stylish! I love all of them, especially the Old Navy tank, I'll have to pick one up soon for myself! Love your outfits! I'm all about basics and staples you can wear time and time again! Those white pants are so cute! I love the tie-front top with maxi skirt look! 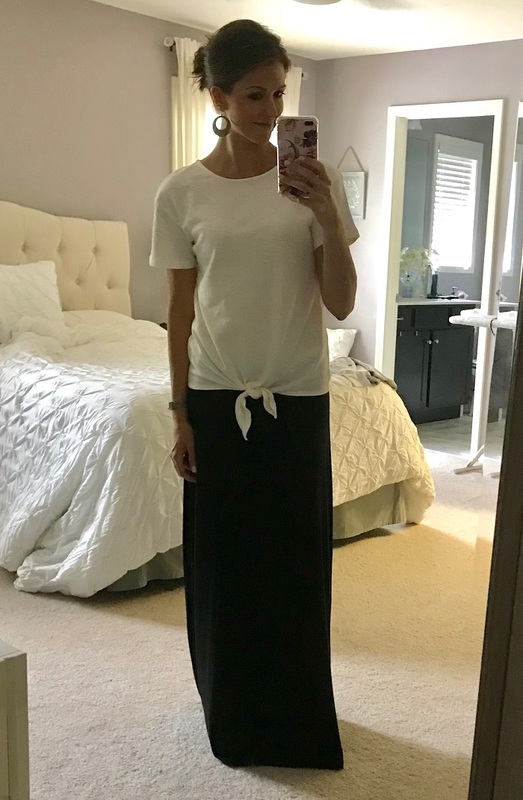 I have a couple of maxi skirts (which are a step out of my comfort zone) but I can never seem to confidently find tops that match well with them. Thanks for the idea! Loved this post and will certainly be ordering some of these items! you look amazing, girl! I’m pretty sure you shared this at some point, but where did you get your bedding from? I love the look and need to redo mine! Also, love all these outfits. My style is super similar to yours. I just resigned from my teaching position to stay home with my baby and it’s weird transitioning out of needing work clothes. I still want to look and feel good but have no use for “fancy” clothes now. Love this post and would love more! Thanks, Megan! It's from Wayfair! So cute and stylish. Loved this post and will certainly be ordering some of these items. You are looking amazing.Thanks for the idea.